Captain Oliver and Chef Vivian are looking forward to welcoming you on board Good Vibrations. Captain Oli, is an easy going and laid back person. His experience with yachting has taken him throughout the Caribbean, both chartering and sailing aboard his own boat. He sailed across the Atlantic on his own vessel and his experiences in the water have given him the ability to be a knowledgeable and skilled sailor. His passion for spearfishing, diving, snorkeling, and exploring has given him the enthusiasm to take others out too. 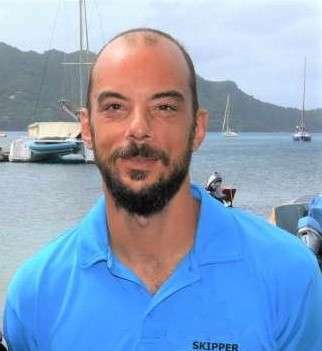 Captain Oli has been sailing on board Good Vibrations for the past 2 years and has done an extensive amount of passages between the Grenadine islands. He loves taking guests to the best anchorages with views, and secluded beaches for the best spots to swim with turtles. For guests who want to learn, they have the opportunity to learn to adjust the sails, change tacks and trim sheets as Captain Oli loves to teach. Growing up in France, he has learned how to create masterpieces in the galley and enjoys cuisines from around the world. The crew are able to accommodate guest's requests and are more than happy to revise an itinerary if necessary as the charter goes on. The crew look forward to guests aboard to explore the Windward Islands.